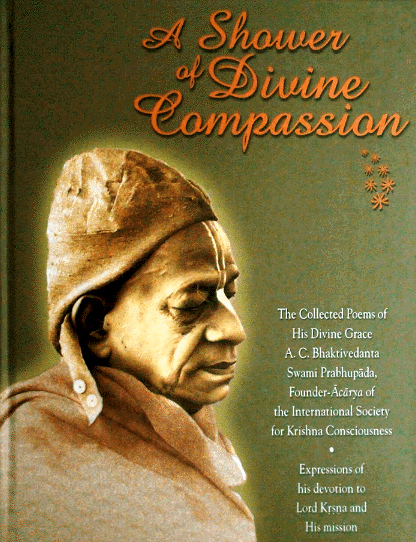 The collected poems of His Divine Grace A.C. Bhaktivedanta Swami Prabhupada, Founder-Acarya of the International Society for Krishna Consciousness. Expressions of devotion to Lord Krishna and His mission. A truly beautiful, uplifting and inspiring book. Just when Srila Prabhupada's followers might have thought that all his literaty works had been gathered and published, we are surprised and pleased to receive this complete collection of his poetry, compiled and translated by Dasaratha-suta Prabhu. It is not that ISKCON has never seen these poems; Srila Prabhupada himself presented some of them to his disciples, and others have been available in the Bengali Vaisnava Songbook for years. Now, however, for the first time they have been collected in one book and presented in English. With great reverence we place before you this anthology of Srila Prabhupada's poems. Most are written in Bengali, one is in English and the final one is in Sanskrit. All the Bengali poems are currently included in the ISKCON Mayapur Bengali songbook, Bhakti Giti Sancayana, and are well known and sung by the Bengali devotees. However, they have been inaccessable to the English-speaking devotees, even though more than thirty years have passed since Srila Prabhupada's disappearance in 1977. I pray that these confidential writings of our spiritual master, finally coming to light at this late hour, may increase the devotional mood of the devotees worldwide. Throughout time, pure devotees of Lord Krishna have composed poetry describing devotional service to Him. This collection of poems reveals the heart and feelings of Srila Prabhupada, the guru who first spread Krishna consciousness worldwide.